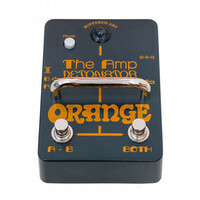 The Orange Amp Detonator pedal is an easy high quality way to run two amplifiers. Having two amplifiers is a great way to achieve multiple tones but it?s often difficult to achieve a smooth switch between the two especially when gigging. The Amp Detonator makes it a simple easy process that is assured to work every time. It?s an active ABY switcher featuring two easy controls: a channel switch and a ?both? switch. There?s also a phase button for calibrating two amplifiers that may be out of sync with each other. The tri-colour LED is useful for easily telling which amp you?re running especially on dark stages. This low noise easy to use pedal puts your confidence back in amplifier switching.